If you find a hidden gem when traveling, you might be tempted to keep it a secret. 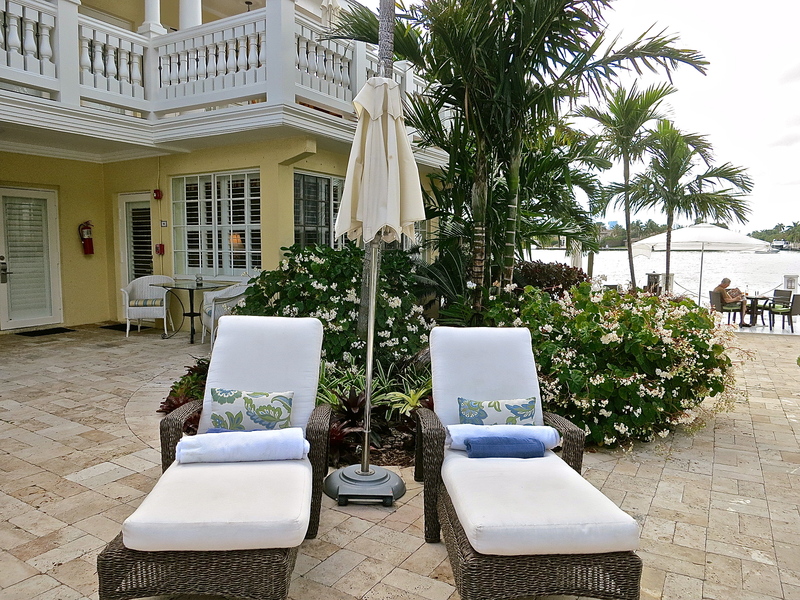 Other times you want to share your discovery with just one friend, which is how last year my husband and I discovered The Pillars Hotel, in Ft. Lauderdale, Florida. I wrote about our stay there in my post Yacht Filled Waterways as I knew my readers would appreciate learning about this intimate eighteen room boutique hotel. One person tells another and soon it is a secret no more…The Pillars Hotel was named the number one hotel in Florida in the 2012 Condé Nast Traveler Magazine’s Reader’s Choice Award. Each winter when the snow on the ground is measured in feet instead of inches, my husband and I like to escape New Hampshire and head to Florida, which war our former home. We are among a large group of citizens of the frozen north who feel they must escape winter’s wrath of bone chilling temperatures, snow and ice and head south to a sunny and warm climate, if only for a few days. While looking out the window at our winter wonderland, I could not help but think of the colorful, tropical gardens of The Pillars Hotel and made reservations to celebrate our anniversary in sunny and warm Florida. We packed our suitcases and headed out the front door, leaving our home as the snow was flying and headed to Florida. You might drive right by the Pillars without noticing it and I’m sure many people have. It looks like a two-story home, painted a lovely shade of yellow with tall white columns surrounded by lush tropical foliage. Walk through the front door and you feel like you are arriving at the home of friends instead of staying at a hotel. Click on any image in the photo gallery below to see full size. The calm interior is an eclectic mix of modern art deco and tropical island style. There are dark wood floors, pale walls hung with original art, white shuttered windows with views of the garden, books, a chess set and a beautiful harp all there for your enjoyment. We were warmly greeted with a glass of wine as we registered, our bags were swiftly gathered and then we were shown to our room. We had a lovely ground floor corner suite which had views of the waterways and was just steps from the pool and gardens. With a beautiful sitting area, wet bar, kingsize bed, a large marble bathroom with a jacuzzi tub and a generous closet, it had all the comforts of home. I wished I could have stayed there for a very long time. We didn’t want to spend all our time indoors as we had flown down from New England to enjoy the warmth and sunshine. Right outside our door, we had a table and chairs where we could enjoy a cool drink. Just a few steps away were lounges where we relaxed beside the pool. We spent three wonderful days enjoying the gardens, pool and sunshine. Click on any image in the photo gallery to see full size. Ft. Lauderdale is called the Venice of America and if you want to see the million dollar homes and mega yachts that line the water, the hotel will arrange for a water taxi to pick you up at their dock. If you want to spurge and entertain friends, the hotel has a beautiful yacht that can be chartered. One evening we saw a group going for cocktails and hors d’ oeuvres just as the sun was setting. The hotel’s restaurant is called The Secret Garden and is only available to guests of the hotel and members of the hotel’s private dining club. Chef Hammi creates wonderful meals each evening with ingredients he gets fresh from the markets and changes the menu each day. You will notice flavors in some of his dishes that are inspired by his Moroccan heritage. Breakfast, lunch and dinner are served to guests in the dining room, casual café or dockside. We choose to have breakfast each morning out on the dock. Click on any image below in the photo gallery to see full size. We also celebrated our anniversary with a romantic dinner on the dock just as the sun was starting to set. We had a delicious meal that was served by candlelight and accompanied with Champagne. Memorable…to say the least. Our stay at The Pillars Hotel was wonderful. We got out of the snow and cold of New England and enjoyed the warm and sunny weather of Florida. We laid out in the sun and turned our pasty white bodies to a lovely tan. Will we be going back in the future… absolutely! We have already made our reservation for next year because The Pillars Hotel is a secret no more. This entry was posted in Uncategorized and tagged boating, Conde Nast Traveler, Florida, food, Ft. Lauderdale, Garden, photography, The Pillars Hotel, travel, tropical flowers. Bookmark the permalink. Looks wonderful, Karen. Happy anniversary!! Thank you Kay, for your wish…we had a wonderful anniversary. The Pillars was the perfect place to celebrate. It´s a wonderful place to beat the winter blues Karen! Lovely pics! Hi Paula, I’m glad you enjoyed the photos. We enjoyed getting out of the snow and cold for awhile. It was great going back to the Pillars…we laid in the sun for three days. How absolutely wonderful it all sounds; beautiful photographs too Karen. Hi Kate, We so enjoyed our time at the Pillars…it was delightful. I’m glad you liked the photos. There should have been a warning at the top of this post for those of us left in NH to not open it seeing that we are getting ready for another storm tomorrow after cleaning up the one from yesterday. 🙂 Have a great time and say hello to all my MG friends who are down there. I adore boutique hotels…and your review makes me want to jump on a plane to Ft. Lauderdale (especially with the COLD, nasty rain pouring outside!). Hi Liz, It so nice nice to get out of the cold and snow for a little bit. I wish your weather was better. I agree with you about boutique hotels.The service is just like what we have had in Europe. The whole staff at the Pillars couldn’t do enough to make your stay special. Maybe you will get a chance to stay one day. Hi Monique, I have to agree with you…it was a lovely getaway. The hotel has that casual feel that Florida is famous for with just the right amount of sophistication to make it special. Thanks for that excellent recommendation Karen, this boutique hotel is just beautiful! I can see why you would want to visit year after year. Happy Anniversary! Thank you Eva, for your nice compliment and wish. We had a wonderful anniversary. I’m glad you liked the post about the hotel. We used to live Miami and I didn’t know about it until last year when we stayed there with friends. I always like to pass along the nice hotels we discover. Happy anniversary! I hope you two are having (had) a wonderful time. What a great place to stay! I’m sure you won’t want to return to the snowy weather of NH after a vacation here! Hi Laura, Thank you for your wish, we had a wonderful anniversary. It was nice to get out of the snow and cold but we just got back home with more snow coming tonight. Such is winter in New England. First and foremost….HAPPY ANNIVERSARY!!! I love botique hotels and in the days of travel agents, we had an agent who would always find the most wonderful botique hotels for us. The customized service and the sincere approach to customer service is wonderful. The Pillars certainly looks like quite the exquisite place. So nice you were able to bask in the sun after being buried in the snow. Happy Anniversay again!! Thank you Tin Man, for your lovely wish. We had a very special anniversary. The small boutique hotels are wonderful…service that you can’t get in the big establishments. I like your description…The Pillars is exquisite. We really enjoyed our stay there but it was all too brief. Looks like a great place to go to escape your black and white world for a few days. Hi Larry, You are right…it was nice to escape our cold black and white world to spend time in the warm and technicolored world of Ft. Lauderdale. It is nice that we got a little reprieve, as we are going to have snow on and off for the next four days. Oh boy, after two days of heavy snow and more to come today, I could really use a couple of days here. A girl can dream! Hi Karen, I totally agree with you. We got six inches of snow as soon as we returned home and have more to come over the next four days. Spring can come soon enjoy this year. Hi Mad Dog, You are so right! It really is nice to escape the cold and snow…if only for a little white. Thank you for your comment. Thank you Kat, for your nice compliment. The sea scallops with the gnocchi and truffles were fabulous. Happy anniversary!!!!! What a delightful way to celebrate. That hotel sure is a gem. Thanks for sharing all the those tropical sceneries, flowers and seafood. My dreary winter morning just got warm and bright from your post. Thank you so much Norma, for your lovely wish and compliment. I thought my gardening bloggers were appreciate all the beautiful tropical flowers. After this cold, gray and very long winter, I thought we could all use some technicolor in our lives. I’m glad you enjoyed the photos. Happy anniversary & what a wonderful way to celebrate it. You do manage to find some very remarkable places to visit and stay. Thank you for passing them on although I do understand the reluctance to keep these gems secret. The only problem with heading out in February is coming back – you know we’re not quite done with winter yet after feeling warm breezes & breathing air that doesn’t lock up your airways…well it’s hard not to extend the stay isn’t it? Thank you Diane, for your wish and kind words. We had a wonderful anniversary celebration. I’m glad that you enjoy when I write about some of the lovely places we visit. I am sometimes reluctant to write about a little discovery that I have made but I do like to share. Hopefully I’ll be able to go to someone else’s discoveries along the way as well. You are so right about traveling in February…it can sometimes be a nightmare. We left when it was just starting to snow and came home right before another snowstorm. We were very lucky this time. It is sometimes hard to come back knowing that winter is not finished with us just yet. Ah, I’m not sure if you’ve heard of if you’re getting what we might have coming tonight into tomorrow…winter is NOT done with us yet! I love getting tips about wonderful places. You are right…winter isn’t done yet…between 3 to 6 inches between tonight and tomorrow morning and more on and off for the next four days. I really appreciate that you enjoy my travel posts as I like sharing lovely places to visit. Thanks again! I must say… I am getting SO tired of staying in hotels that don’t provide harps!! Oh John, I haven’t stopped laughing at your comment. I’ve seen some of the hotels where you have stayed while working. Perhaps you could leave a note in a suggestion box. LOL. The Pillars is a beautiful destination and, as you mentioned, it’s a well kept secret here in Florida. So glad you were able to warm up in such a grand location. It is lovely. Hi Mary, I’m glad that you agree with me about The Pillars…it is an absolutely wonderful place to stay. It was a well kept secret but now that it was named the number one hotel in Florida in Conde Nast Traveler the secret is out. Every person that was staying there this trip were already making their reservations for next year just as we did. Lovely looking hotel! Florida is so great at this time of the year (most times, really, but it really shines from late November through late March). I’ve been to Fort Lauderdale, but have spent most of my Florida time on its west coast (we lived in Tampa for over a decade), so I don’t really know it at all. Definitely a place we should visit sometime, and the hotel is just what we like. Thanks so much for the recommendation. Hi John, I’ll have to check with you for hidden treasures if we go to the west coast of Florida. We lived on the east coast of Florida in Coral Gables and I never knew about The Pillars. It is funny that I learned about the hotel from a friend who lives in Connecticut. I’m always happy to pass on the places we enjoy visiting to my readers. I think you would really enjoy the hotel if you get to Ft. Lauderdale. Thank you Kay, for your nice compliment. It is nice to know that you enjoy our traveling adventures…a short trip but it was lovely. The Pillars is definitely your kind of hotel. I wish I could have posted a few more photos of the food but dining outside by candlelight can be a little challenging when it comes to photographing food. Oh how I would love to be under that cabana! Hi Leilani, Thank you for stopping by for a visit and your comment. Isn’t the cabana lovely…a perfect place to relax and watch the boats passing by. Loving your captures – what a beautiful place and the food – YUM:) Happy Tuesday! Thank you Renee, for your nice compliment. I’m glad you enjoyed the photos. Have a great week. Happy Anniversary Karen! You stayed in a beautiful hotel and I can see that you had such a great time there! Thank you Katerina, for your lovely wish. We had a wonderful and memorable anniversary. My childhood stoping grounds. So lovely. Thanks for sharing. Hi Victoria, I’m glad you enjoyed the photos. I’m sure that they brought back memories of your time in Florida as I know you speak of it often. A lovely and beautiful hotel! Hi Angie, I totally agree with you…the hotel is lovely. Thank you for your comment. How great to get away from the snow to the sun, to celebrate your anniversary & made even more wonderful for you being in a fabulous hotel. My hubby & I always choose the smaller type hotel. There you are treated as a guest & not a room No, From your lovely photos I can see why you will return, happy anniversary even though you have already celebrated it. Hi Barbara, Thank you for your lovely wish…we had a wonderful anniversary. I have to agree with you about the small hotels where you get personalized service and are remembered from year to year. I can’t wait to go back to the hotel again next year as it really is special. Hi Rosa, I wish you could fly over and enjoy it as well. I know your winter has been like ours and a little break is always nice. Thank you for your nice comment. I will put it on my very long list of beautiful places to go in this world! Thank you! Hi Anne, I have to agree with you about The Pillars. With only 18 rooms, they really know how to treat their guests…it is a wonderful hotel. I know what you mean about the beautiful places on our wish lists. I keep adding ones to mine all the time. I’m glad you enjoyed the post…thank you. It looks so lovely. What a perfect winter’s escape. And happy anniversary. Do you think the hotel was originally built as a home? Thank you for your nice wish, Charlie. We had a wonderful anniversary. Yes…the front section of the hotel was a home originally built in the 1930’s. Then a motel was added in the back. Now it has been remodeled into this lovely little 18 room hotel. They did such a great job, I think. Thank you Katie, for your lovely compliment and wish. I’m glad that you enjoyed the post. Lovely stuff Karen. I see you had a fantastic time. Thank you Conor, for your lovely compliment…I’m glad that you enjoyed the post. We did have a wonderful time. So very lovely ~ a great read, thank you for sharing. 🙂 love the photographs!! Hi Karie, Thank you for stopping by for a visit and your nice compliment. I’m glad you enjoyed the post and photos. Hope you stop by again. -What a way to spend it! The food looks like a good enough reason to return. Thank you Johnny, for your nice wish. We had a very memorable and lovely anniversary. The food at the hotel is delicious and being able to sit by the water in the candlelight made it all the nicer. What a gorgeous hotel, the perfect place to celebrate an anniversary! Hi Laura, I have to agree with you, The Pillars Hotel was the perfect place to celebrate our anniversary…so much so that we will be celebrating there next year. Thank you for your comment. Oh My, Karen, do YOU know HOW to travel! Wow! Hi Bella, Thank you for your very nice compliment. I do put a lot of research into finding special places to stay when we travel. I’m glad you enjoy my travel posts. Happy Anniversary after the event and ‘thank you’ for having taken us along. Enticing pictures of feeling one was at a house party in a stately home. Lovely 🙂 ! To each their own: having had a love affair with orchids since childhood, absolutely adored those photos! Thank you Eha, for your lovely wish….we had a wonderful anniversary celebration. I’m glad that you enjoyed following along on this little trip. The Pillars does feel like you are a guest in someone’s home…actually a close friend’s home because of the caring attention to details that make you feel so welcomed. The orchids were throughout the grounds and the hotel and were beautiful. Happy Anniversary – what a way to spend it: The flowers, the food, the HARP! wonderful! Thank you Kelly, I appreciate your nice wish. Our anniversary trip couldn’t have been nicer. As you say, everything at the Pillars was wonderful. Hi Lorraine, If you get a chance to travel to Florida and will be in the Ft. Lauderdale area, I can’t think of a nicer little hotel to stay at. It has won so many awards and there is a reason for it…the service is incredible. If you do decide to stay there, I would be happy to give you ideas of other things to do and places to eat in the area. You might want to read my posts from last year about Delray Beach and Vero Beach if you are planning to visit the east coast of Florida. Karen, this is exquisite and magical. Your pictures are beautiful. And I love everything! That chess board looks huge or is it the picture? I love Ft. Lauderdale and have never heard of this hotel. Last time I stayed at Lauderdale by the Sea. But not as gorgeous as this is. I love it. I am so glad you had fun and relaxation! Thank you very much for sharing this with us. Thank you Judy, for your lovely wish and kind words. I’m glad that you enjoyed the photos…and yes, it is just the angle of the camera that makes the chess set look large than it really was. Don’t feel bad about not knowing about The Pillars…I lived in Florida and didn’t know about it either. I’m glad that you enjoyed the post. Hi Celi, I’m glad that you appreciated the comment about our pasty white bodies…a lot of us have them this time of the year. 🙂 If you ever visit Florida, I know you would enjoy staying at The Pillars…everything about it is wonderful. Wish we could have stayed longer. I totally agree with you Celi, the small hotels give such personal service and try to make your stay very special. I hope the weather starts warming for both of us. Hopefully your firewood will get you though the last of the cold weather. This place looks beyond gorgeous. I love all your photos. And the interior art deco touches–swoon! Happy Anniversary too. Looks like you picked a very beautiful spot to celebrate your love! Hi Heather, The Pillars is as wonderful as it looks and it was the perfect place to celebrate our anniversary. I actually thought about you on this trip as we went back to the restaurant that inspired the fish taco recipe that I recreated for you. Thank you for your nice wish, Jessica. We had a lovely anniversary in Ft. Lauderdale and the hotel was a wonderful place to spend it. Thank you for taking me away from the freezing rain and snow, even if only briefly. Hi Marlene, At this time of the year, we all need a break from the winter weather. I’m so glad you enjoyed the post…thank you for your lovely compliment. WIth your lovely descriptions and beautiful photos, Karen, we can all easily see and understand why the Pillars Hotel is so highly rated. It sounds like the perfect place for a little respite from the North Wind. Hi John, The Pillars was the perfect place to escape the snow and cold. For three days, I stayed by the pool enjoying the warmth and sunshine. Now I’m back to cold and more snow. Thank you Sawsan, for your nice wish…we had a lovely anniversary. It is the small details that make a hotel special and The Pillars excels in that department. B/W I am loving the pics! Thank you Reem, for your lovely wish. I’m glad that you enjoyed the post and photos. When we travel, I take our small point and shot camera. I’m pleased with the pictures I get using it. Hi Roger, Our stay in Ft. Lauderdale at the Pillars was just what we needed. It was lovely getting out of the snow and enjoying sun and warmth for a few days. Beautiful – belated greetings to you both! Thank you Tanya, for your wish…it is very much appreciated. I’m glad that you enjoyed the post and photos. Gosh that looks like utter paradise, especially with the crazy weather some of the US have been getting! Hi Carolyn, I did feel like I was in paradise…especially was all the beautiful tropical flowers. It was lovely to get out of the snow and cold for a little while. Karen I am contemplating this heading S in Feb for a few weeks when I retire, but I have never quite been able to love FL….of course I have much to see there if I go and this may be one spot along with the Keys. Hi Donna, You made me smile with your comment…I have felt the same way about Florida. We lived in Florida for many years, in Miami, Coral Gables and Key Largo. Traffic and congestion is the biggest problem in south Florida, we are not used to it anymore. What we do like about visiting Florida is that we can take a break from the snow and cold and visit our children and friends who are there. We love staying at the Pillars because it is hidden away in such a tranquil spot. There are many parts of Florida that you will love. If you decide to go, I’ll be glad to help with suggestions. Thank you GG, for your lovely compliment. We had a wonderful anniversary and the stay at The Pillars was terrific. Thank you Meg, for you nice compliment. I’m glad that you enjoyed the post and photos. Hi Tandy, I have to agree with you…The Pillars does feel like you are staying in a home instead of a hotel. A glass of wine while checking in was a lovely touch. There was sparkling water and fresh berries waiting in our room for us as well. Hi Sylvia, I have to agree with you and we already booked to celebrate there next year. The Sunshine State lived up to its name this year…last year we had a lot of rain during the same period. I’m not always a huge fan of Florida, but wow, that is an appealing hotel. I hope you had a lovely time celebrating your anniversary! Hi Cucina, I’m not a fan of the traffic in south Florida, but we stayed in a lovely quiet area of Ft. Lauderdale away from the crowds. It was a little piece of paradise and the perfect spot to celebrate our anniversary. Thank you for your nice wish. I’m drooling Karen. What a gorgeous hotel! I love the mix of classic and tropical…so luxurious and warming. I’ll just picture being on those lounges, sipping something tall, cold and strong and reading a good book. Yep, that’s what i am going to do. You made me smile, Geni because that is exactly what I did for three days and loved every minute of it. The hotel is lovely and I agree with you about the decor. I’m glad you enjoyed the post and photos…thank you for your nice comment. Hi Lesley, Thank you for stopping by for a visit and your nice comment. I know what you mean…we lived even closer in Coral Gables and didn’t know about it either. The Pillars is absolute wonderful…a hidden gem if there ever was one. I look forward to your visits in the future. This looks positively delightful Karen, so happy you could get away. I lived in Wisconsin for 27 years so I totally understand the joy and anticipation a warmer climate brings. Have a wonderful time! Hi Chris, We enjoyed every moment of our stay at The Pillars. Getting out of the snow and cold and sitting by the water in the warm sunshine was wonderful. What stunning accommodations and food. And a very Happy Anniversary to you. Looks like a wonderful place to spend it and Ft. Lauderdale is always fun! Thank you for your wish, Betsy…we had a wonderful anniversary. We enjoyed our stay so much that we already booked the same room for next year. Ft. Lauderdale is a fun place to visit, especially with so many good places to eat. Happy Anniversary! Lovely photos and hotel! Hi Tessa, I appreciate you wish. We have a lovely anniversary. I’m glad you enjoyed the photos. Hi Mary, The hotel was a great find. We used to live 30 minutes away from it when we lived in Florida and didn’t know about it. We had a wonderful time staying there enjoying the warmth and sunshine. It made for a perfect anniversary. Have a nice day as well Mary and thank you for your lovely comment. Hi Dana, Don’t you just love the orchids…there were so many throughout the gardens and even inside the hotel. We had a wonderful anniversary…thank you so much for your wish. How gorgeous. It looks more like a private home than a hotel. Thanks for the tip and happy anniversary. Hi Sam, Don’t you love how The Pillars feels more like a hotel than a home. It was a wonderful place to spend our anniversary…thank you for your wish. Hi Karen – thanks for leaving a note at my blog, so much we have in common! Including a love of travel, especially to warm places when New England is grey and cold!!!….. Perhaps we’ll stay at this lovely little hotel one of these days, thanks for the tip! Hi Karen, Thank you for stopping by for a visit. We do have so much in common…from our names to both living in restored historic homes. If you plan on visiting the Ft. Lauderdale area sometime, I’m sure you would love staying at The Pillars. This was our second stay and we have already booked for next year. Now that’s my kind of vacation! Happy Anniversary too! On another note, no spam & I published your comments. Thank you for the visit, have a lovely weekend! Hopefully no snow! Thank you Mary, for your lovely wish. We had a wonderful anniversary and really enjoyed the warmth for a few days. Thank you for letting me know that my comments got through to you. Most of my comments on the blogspot bloggers that I follow are not going through. I’m hoping for no snow as well…enougn is enough! Wow Can I transport to there right now? Looks amazing, stunning pics! Hi Natalie, If you find a secret way to transport there…take me back. 🙂 The Pillars really is an amazing hotel…we love it. Hi Debra, We had a lovely time staying at The Pillars…it was our second visit. We had perfect weather which we certainly enjoyed. Yes, I’m hoping that our snow season will be coming to an end shortly. Thank you for your nice comment. Hi Diane, We so enjoyed our time away for the snow and cold. The Pillars was arelaxing getaway…we certainly enjoyed the sunshine. If money was no object, I’d love to spend April to October being in France as well. One of my absolute favorite countries to visit…we just have to keep dreaming. Thank you for your wish and comment. Hi Joanne, It was a lovely stay…the warmth and tropical gardens were wonderful. I am already wishing I was back at The Pillars instead of looking out my window at the snow covered ground. Karen, do you plan to edit a “best hotels in the world” guide? I’m sure you already have quite a collection here! This one looks breathtaking! Hi Sissi, We have stayed at some wonderful hotels in our travels and The Pillars was a lovely one. The attention to detail is what makes this hotel special. A book would be fun because we have visited some memorable hotels. Thank you as always for your lovely compliment. What a nice escape, staying in such a lovely hotel and enjoy food and beautiful flowers. Hi Amy, Thank you for stopping by for a visit and your nice comment. It was a perfect escape from the cold. The sunshine and warmth, tropical flowers and the lovely hotel made for a wonderful trip. It looks like a real gem of a place. What a great find. Thank you for sharing it with us. Now I just have to get to Florida. Hi France, I truly think that The Pillars is a real gem. If you do get to Florida and are going to be in the Ft. Lauderdale are, I would definitely recommend the hotel…it is lovely. I love hotels and hotel designs! This one’s just gorgeous! Reminds me of The Betsy Hotel in Miami! Love those California shutters! California in Fort Lauderdale? Awesome…! Hi Jen, Thank you for stopping by for a visit and you nice comment. I agree with you, the Pillars has been beautifully decorated. It is sophisticated and casual at the same time. Yes, “California” shutters are very popular in Florida…we had them in our homes when we lived in there. Oh my, what a beautiful place to stay. A getaway to the sun is so welcome during the north’s cold winter months. Hi Cathy, I do have to agree with you on both counts. The Pillars is a beautiful hotel and was perfect for a little escape from the cold and snow. Thank you for your nice comment. This hotel looks stunning! And what an amazing setting for a romantic meal!! Thank you Afra, for your nice comment. The hotel really is a lovely place to visit. Having a meal by candlelight next to the water was a perfect way to celebrate our anniversary. Hi Piera, Thank you for stopping by for a visit and your nice compliment. I’m glad you enjoyed the photos. Your fashion blog is cute…good luck with it. Karen, this really looks like a fabulous place to visit! I am glad you are able to get away from winter to such a gorgeous locale. Ahhhh…. I am counting down the days until we go to Florida next month to visit my parents at Fort Myers Beach. It may be the opposite side of the state, but it has a dear spot in my heart. Hi Kathy, Isn’t the Pillars lovely. It was wonderful to get out of the snow and cold, if only for a little while. We visit the east coast of Florida as that is where we used to live and have family and friends there. I hope you have a nice time visiting your parents in Fort Myers Beach…I haven’t been there in a long time. Enjoy the warmth and thank you as always for your nice comment. Karen, what a breathtaking place to visit…I am a bit speechless right now and cannot get over the amazing hotel, the views, the food, just everything! You are truly fortunate to be able to spend such an amazing time there with your husband! What a fantastic post and thank you also so very much for taking the time to visit and revisit my blog – truly appreciated! Hi Andrea, I agree with you…The Pillars was a lovely place to visit. Spending time in the sun and warmth was a wonderful way to spend our anniversary. I’m happy that you enjoyed the post and appreciate your lovely compliment. I was having a terrible time posting comments on many of the blogs I follow…one of them being yours. If at first you don’t succeed, try, try again. Hopefully the problem is fixed. I hope you are having a nice weekend as well. Hi Rebecca, I’m glad that you enjoyed the post. The Pillars is my favorite place to stay in Ft. Lauderdale. You’ve completely sold me on the Pillars! It’s been a while since I’ve been to Florida, but I’ll put this on my “must visit” list the next time I’m there. Hi Beth, I do think you would be very happy staying at The Pillars…we love it. Most all the guests are repeat visitors from all over the world. Just be sure to reserve early, now that they have added another award to the many they have already received. Hi Elizabeth, I’m glad that you enjoyed the post. I really think The Pillars is a lovely hotel and was a perfect to celebrate our anniversary. What a beautiful hotel. We are hoping to do a Caribbean cruise at some stage and this would be a great place to stay enroute. Hopefully we’ll get to stay there sooner rather than later – the food sounds great too! Hi Christine, I think you would enjoy The Pillars…my husband and I had a lovely stay and the food was delicious. We met two people that were staying at the hotel and then continuing on to a cruise. Thank you for your wish, Nami. We had a wonderful anniversary celebration. I’m glad you enjoyed the post and photos about The Pillars. I agree with you…when I’m planning a trip I much prefer experiences from real travelers and their own photos. I’ve added the Pillars Hotel into my little black book ready for, hopefully, a visit one day! It looks fabulous. Hi Jenny, This was our second stay at The Pillars and thoroughly enjoyed our time there. We love the attention to detail and the service that you don’t get at some large hotels. I think you would enjoy staying there…we have already made our reservations for next year. oh I wish I could be there right now! absolutely stunning… thanks for sharing. Hi Barbara, I’m happy that you enjoyed the post. I wish I was back at the Pillars right now with you. We could talk about cooking as we sat by the lovely pool. But alas, I am at home and it is snowing again. What a wonderful way to celebrate. Happy belated anniversary, by the way. This is such a gorgeous hotel and your pictures really capture the great weather and views. I would love to have breakfast at the dock too, that’s view is so peaceful and calming. Perfect way to escape from the winter wonderland! Wish I can visit too. Thank you Amy, for your wish. It was wonderful to celebrate our anniversary at The Pillars. It is a lovely place to enjoy the sun…breakfast at the dock is a great way to start the day. Wish I was back as it has snowed the last three days. Looks like a wonderful place to celebrate your anniversary! Many best wishes for years of joy to come. Thank you Ladyfi, for your lovely wish. The Pillars was a lovely spot to celebrate. I especially enjoyed the sunny gardens. Doing a little catch up this morning… This looks dreamy! I didn’t remember that you lived in Florida in the past – (I was born and raised in Winter Park/Orlando). That must have been some shock moving back to NH! Hi Wendy, One nice thing about the blogging world is that we find out we have so many things in common. It was nice to enjoy the sun and warmth of Florida for a little while as we came back to plenty of snow and cold. I should be starting my seeds in another week or so. Hi Carol, I’m back in New Hampshire and have my snow boots waiting for the next storm. At least we had a few lovely warm days of sunshine. Hi there! This is my first visit to your blog, and this is the article I chose to tempt me!!! It’s still very cold here in the Kansas City, MO area, and sunshine is very hard to come by. (We act like vampires when the sun does finally make a brief appearance….hiding our eyes and acting as if it’s burning our skin! :-)) I could use a refuge like this right about now. Going on that yacht in the evening would be just what the doctor ordered for me!!! I love the decor in that living/sitting room (with the harp) and the bar area, too! Just beautiful!!! Hi Alycia, We are having the same cold weather here in New England…got a foot of snow on the last day of winter. The Pillars is a lovely place to visit…it was an especially nice break from the cold of winter. Thank you for stopping by for a visit and your nice compliment.